We, as a society produce more photographs than ever before. This year, it is estimated that billions of humans armed with smartphones will take some 1.2 trillion pictures. Many of them will be shared on social media, but more will simply be forgotten. Hardly any will make the transition into the physical world, becoming blots of ink that magically form into an image on a piece of paper, canvas, wood, or metal — a print. The reasons for this are very understandable and there’s no point fighting progress, but nor should we ignore the value of a print. We may no longer print every photo but this can actually be a good thing for printing. It is now about quality rather than quantity, and the pictures we choose to print deserve the best treatment. Honestly, there has never been a better time to print than now. Rather than bemoan the decline in quantity of photos printed, let’s celebrate the fact that digital has given us new technology and new avenues for producing high quality prints. We have the tools today to make better prints than ever before. Printing for archival reasons is a logical thing to do, but the real reason you should start printing is emotional. When done correctly, seeing a high quality print of an image that means something to you is completely intangible. There is just something about holding a finished print in your hands that is infinitely more satisfying than seeing your photo on a screen. Had the fantastic opportunity and experience today of photographing the Cairns Bhutanese Community fashion show. The traditional dress on display was really a sight to see. The most amazing colours and designs were on show! Thanks to the Cairns Bhutanese Community for asking me to photograph this show. Some of the most genuinely welcoming and friendly people around! Not to mention the amazing food! Thanks once again for the hospitality! I am very happy to have my "Fields of Fire" photograph included in the Leichhardt Community Calendar. 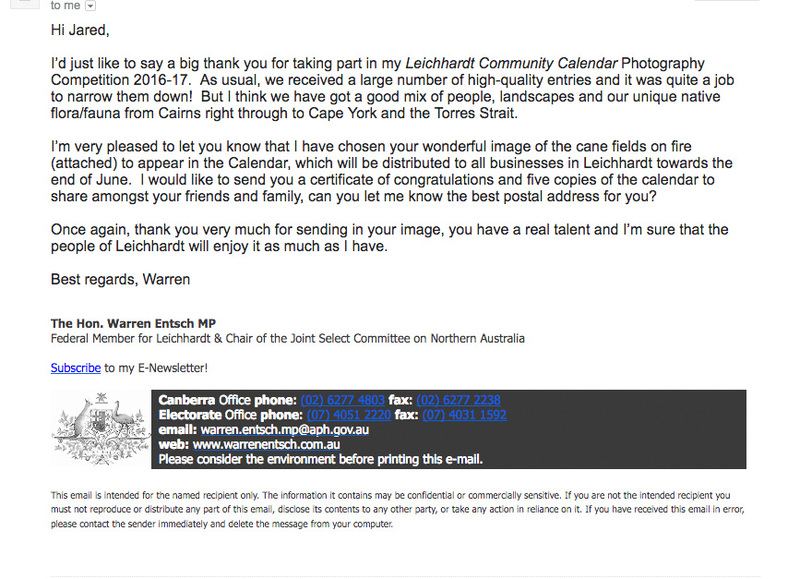 Warren Entsch is the Federal Member for Leichhardt, and every year calls for submissions from local photographers to showcase the area. The calendar goes out to local businesses within the electorate. I eagerly await a copy to see some of the great talent out there!